The Okino Tori Shima islands, 1,118 miles south of Tokyo, consists of two rocks which barely pierce the water during high tide. Although the islands themselves are worthless, owning them gives Japan exclusive fishing and mining rights to more than 154,452 square miles of ocean that surround around them. Rich cobalt and manganese deposits may lie in the seabed offshore and the waters are teaming with fish and squid that help feed Japan's voracious appetite for seafood. The Law of the Sea states the islands must be above sea level. To maintain their claim on the islands, which are only 27 inches above sea, the Japanese government spent several million dollars to build a wave absorbing barrier to keep the islands from being eroded by the sea. 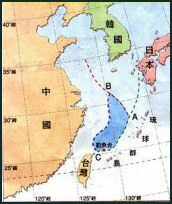 The South China Sea in which the islands lie is important to Japan. About 70 percent of Japan’s imported oil passes through the South China Sea. China claims most the South China Sea. Senkaku-Diaoyu Islands map Both China and Japan claim the fish-rich and potentially-oil-rich islands---known to the Japanese as the Senkaku Islands, to the Chinese as the Diaoyu Islands and to the Taiwanese as the Tiaoyutai Islands---between Okinawa and Taiwan in the East China Sea. The Senkaku Islands are in Ishigaki, Okinawa Prefecture. Covering only seven square kilometers of uninhabited, rocky land. they comprise five islets--Uotsurijima, Kita-kojima, Minami-kojima, Kubashima and Taishoto--and three rocks. The islands are now uninhabited but in the 1940s there was a bonito processing factory on Uotsurijima, the largest of the Senkakus. China and Japan both see the islands lying between them as symbols of national pride. On January 14, 1895: The Japanese government formally obtained control of the Senkaku-Diaoyu Islands. Japan asserts the islands were not owned by anyone prior to their occupation while China maintains it has sovereignty over the island chain for centuries. On September 2, 1945: Senkaku-Diaoyu Islands, as part of Ryukyu Islands, came under the US goverment's control after the surrender of Japan at the end of the second world war. On June 17, 1971: The Agreement between Japan and the United States of America Concerning the Ryukyu Islands and the Daito Islands was signed between Japan and the US, returning the Senkaku Islands (as part of the Ryukyu Islands) to Japanese administration. This triggered the first anti-Japanese protests, led by Taiwan. On: August 12, 1978: The Japan-China Peace and Friendship Treaty was signed between China and Japan, in which the dispute over the isles is put aside for future resolution. On July 14, 1996: Right-wing Japanese Youth Association members landed and built a lighthouse on one of the islets, prompting a series of protests from mainland China, Hong Kong and Taiwan. On September 26, 1996: Hong Kong activist David Chan drowned after jumping into waters off the Diaoyu Islands during a pro-China protest. On September 29, 1996: Tens of thousands of people gathered for a candlelight vigil in Victoria Park to mourn David Chan’s death and protest against Japan’s claim of the islands. On October 7, 1996: Three activists from Hong Kong and Taiwan landed on the Diaoyu Islands. On March 24, 2004: Activist Feng Jinhua and six others from China land on the Diaoyu Islands, the first time mainland activists successfully landed on the islands. The Japanese claim on the Senkaku islands dates back 1895 when the islands were declared by the government as part of Okinawa prefecture. After the signing of San Francisco Peace Treaty in 1951, Japan formally lost all of the territories it acquired after 1895. There was little interest in the islands until a geological surveys released in 1968 and 1972 reported their might be oil and minerals around the islands. Also at stake are the fishing rights. Financial Times among others has pointed out Beijing “did no challenge Japan’s sovereignty claim” until learning that the sea floor near the Senkakus could hold oil deposits. During the U.S. occupation of Okinawa, the Senkaku-Diaoyu Islands were used for military drills by U.S. forces. When the U.S. returned Okinawa to Japan in 1972, the Japanese also claimed the Senkaku-Diaoyu Islands. When Japan and China signed a joint communique in 1972, the issues of the islands was not raised. When China and Japan signed a peace treaty in 1978, vice-premier Deng Xiaoping said the dispute over the islands "will be shelved until the next generation comes up with a solution." Also in 1978, the ultra-rightist group Nihon Seinen Sha (Japan Youth Federation) set up a makeshift lighthouse on the largest of the islands. After of period of time the same group returned to the island to rebuild the lighthouse and seek official recognition. Senkaku-Diaoyu Islands map In 1996, ultra-nationalists erected on a lighthouse (actually a thin aluminum beacon about 15 feet high) on the main Senkaku-Diaoyu island. By this time four of the five islands were technically the private property of two Tokyo businessmen active in ultra-nationalist politics. Beijing was upset by Tokyo's tolerance of the actions by the ultra-rightists. The people of China, Taiwan and Hong Kong were all unified in their disgust with Japan. In Hong Kong in 1996, protestors took to the streets and burned a Japanese flag. One Hong Kong teacher told Newsweek, "Our dream is that the Beijing navy would sail in from the left, the Taiwan navy would sail in from the right and we would take the Japanese together as a strong national force." In September 1996, a freighter with 18 protestors from Hong Kong and Taiwan was turned back from the islands with the lighthouse by Japanese coast guard ships. Four protestors jumped into the water to symbolically claim the seas around the island for China. One of the protesters, 45-year-old David Chan, drowned in the choppy seas. In March 2004, seven Chinese nationalists land on Senkaku-Diaoyu. They were arrested by Japanese police and coast guard personnel that arrived by helicopter. The seven were detained for a couple days and deported. The incident got quite a bit of press coverage in Japan and stirred up nationalist sentiments. In Beijing, a few dozen people held ani-Japanese demonstrations outside the Japanese embassy. China has also been angered by textbooks that show disputed island in the East China Sea as belonging to Japan. Senkaku-Diaoyu Islands map There are large undersea natural gas fields in waters claimed by both China and Japan in the East China Sea about halfway between Okinawa and the Chinese mainland. The Chunxiao and Tianwaitian natural gas fields lie in China’s exclusive economic zone. The Chunxiao field covers 8,500 square miles and holds up to 9 trillion cubic feet of gas, enough to meet China’s needs for seven years. Senkaku-Diaoyu Islands map, areas claimed by Japan and China In June 2004, China began developing the Chunxiao site. It is now aggressively drilling at Chunxiao and Tianwaitian while Japan has yet go beyond doing geological surveys partly because the most promising areas for oil and gas are in disputed areas. China has gas production platforms less than a mile west of waters claimed by Japan. Japan claims that this platform is sucking gas from a deposit that extends over Japan’s side of the line. Solution to the Diaoyu-Senkaku Conflict: Making it a Marine Reserve? The Chinese writer Yan Lianke wrote in the New York Times, “Raucous clashes triggered by the recent Sino-Japanese territorial dispute have made creative writing impossible for me. I’ve been devoting all my time to following the news, anxiously delving into every new development. Again and again, I ask myself: What turns an interminable island dispute into a fireball? Who can put out the flames? Who can make politicians sit down to sip iced tea together and engage in calm and courteous dialogue? Where are the voices of reason? I long for more rational voices, I long to hear from my fellow writers. [Source: Yan Lianke, New York Times, October 5, 2012. Yan Lianke is a Chinese novelist and short story writer based in Beijing. English translations of his works include “Serve the People!” and “Dream of Ding Village.” This article was translated from the Chinese by Jane Weizhen Pan and Martin Merz. “We are all human beings,” Murakami wrote in his powerful Jerusalem Prize award acceptance speech delivered in Israel in 2009, “individuals transcending nationality and race and religion, fragile eggs faced with a solid wall called The System. To all appearances, we have no hope of winning. The wall is too high, too strong---and too cold. If we have any hope of victory at all, it will have to come from our believing in the utter uniqueness and irreplaceability of our own and others” souls and from the warmth we gain by joining souls together. I know little of territorial issues, politics and military matters. My love for literature and culture, however, knows no borders. Compared to those who devote all their attention to territorial aggrandizement, I am more devoted to world literature and culture. As a Chinese writer, I long for the day when we can let politics be politics, and culture and literature will be left alone. Culture and literature are the shared bond of mankind. When political instabilities arise, I hope this bond will not again be the first casualty. After all, culture and literature are the root of our existence, and cultural exchange is about sharing universal emotions and experiences. When culture is abandoned, when literature is discarded only to gather dust, when the root of our existence is severed, does the size of a territory really matter?